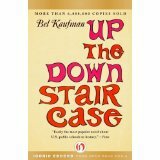 The first book I envied was Bel Kaufman‘s Up the Down Staircase. It should have been my book! I knew what it was to cherish language and literature. Like Kaufman’s main character, I was naive enough to think I could instill an appreciation for truth and beauty in my teenage students. My days often felt insane. Why didn’t I put all that together? Many answers come to mind, but this one tops the list: I didn’t find anything funny about my job. But I loved that book. For good or bad, I have to write the book that I can write. But how about this: is there a book that can only be written by me? I think so. And one for you, too, even if you’ve never written anything. It doesn’t have to be the story of your life or a memoir of a significant time. On a book that only you can write, you’ll stamp not just the drive of your DNA, but ideas and sensory impressions of your lifetime. Doesn’t matter whether you tell the truth as you remember it or create fictional characters and story. How do you find the book that only you can write? For a start, don’t imitate. Strive for honest expression. Too many writers try to write the book they love to read and end up with sad copies. Whether you’re writing romance or science fiction, an honest story will come from your understanding and way of seeing. That doesn’t mean you’ll write about yourself. But if you’re honest, readers will know your heart. What can’t you forget? What do you see? What do you hear? What’s good, what’s evil, what’s just? Your lifetime impressions lie waiting to be remastered in the book that only you can write. I often get ‘I could write a book’, or ‘I’ve a great story’ from many who hear that I’m developing a novel, but their stories will remain unwritten because they don’t have that ‘vocational madness’ inherent in a writer’s heart. I think that integral honesty goes out the window when a writer decides to write for the market. I suppose some would say it’s difficult enough to get published without stepping outside of that box. ‘Vocational madness’ – so true! Also true about writing for the market. I read author blogs that are much more honest than their published works, which to me means they could write better books. The beauty of self-publishing is you don’t need a mass market to share the kind of book you want to write.